Finally got my hives painted! Took a bit longer than I’d expected, but not too bad. You’ll notice that one of the hives has a light brown stripe near the bottom. I’ve read that the Italian race of bees finds their hives by color in addition to just direction, so I thought I’d try making that one a little different. It might help keep those bees from getting lost and trying to enter the other hive. Not sure how much difference it’s going to make, especially since it may not be quite enough contrast between the colors. (White probably would have been better, but this is what I had on hand.) It’s probably not a big deal either way, but it can’t hurt. 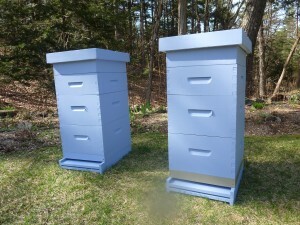 Besides, it’ll help ME remember which hive is which. Note: I’ll be putting these up on cinder blocks before the bees get here, to keep the wood off the damp ground.